Stand out in your kayak. 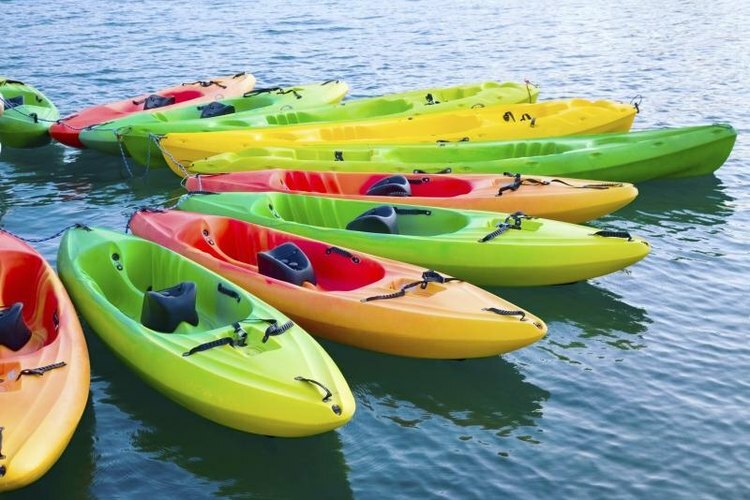 UV rays can damage or fade the color of a plastic or fiberglass kayak over time with minimal exposure. Properly cleaning and applying protective gel coats can increase the life and durability of your kayak. While abrasions and holes must be patched and resurfaced, restoring the color of a plastic kayak is a relatively simple process. Clean the surface of the kayak with soapy water to remove any dirt, debris or mildew. Dry the kayak thoroughly with a towel. Apply a colored automotive polish that matches the color of your plastic kayak. Follow the polish manufacturer's instructions for applying the polish. This will restore the color of your kayak and prime it for applying a protective coating. Apply a coat of plastic gel protectant to seal in the color and protect the hull from harsh UV rays. Allow the kayak to dry for three days before use. Ensure that the kayak is completely dry and doesn't feel sticky to the touch before attempting to use.